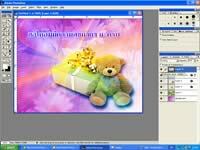 Make greeting card with photoshop. 1. 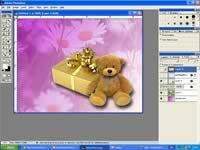 Create a new file and set the size of the greeting cards that we want to do. 2. 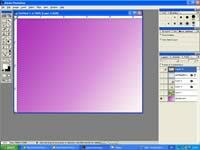 Select the linear Gradient tool to make background. Choose a color for the background. Mouse click and drag the color to the desired direction. 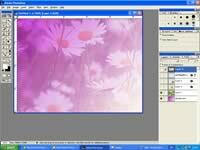 3.Find flower images. And make it to the background layer onto the top. And the percentage of this layer Opacity to 40%. 4. The picture you want. Trim off the edges of the image that does not want to leave.Using a drop shadow is a shadow to the image. 5. Enter the text description. In your greeting card. Choose the color of the text before Assigned to the left or right or middle. 6. Find light effect images. And make it to the background layer onto the top. And the percentage of this layer Opacity to 40%. And Overlay. Making greeting card on your own baseline. If you think difficult. I try to make greeting card on the web without using photoshop.